LaNiyah Bailey, nationally recognized youth advocate for anti bullying and weight issues, provides Smile scholarship for teens and tweens to attend MindStream Academy. Two time youth author on weight loss and anti bullying, LaNiyah Bailey, announces the dedication of scholarship funds to attend MindStream Academy. LaNiya’s Smile is a special scholarship award providing financial assistance to students aged 12 to 17 in their fight for a stronger, healthier body and mind and renewed self esteem. LaNiyah Bailey is not only an inspiring youth advocate, but was recently recognized as one of "TheGrio’s 100: History Makers In The Making." Released by theGrio.com, a division of NBC News, the list includes 100 African-American men and women who are writing the next chapter of American history. 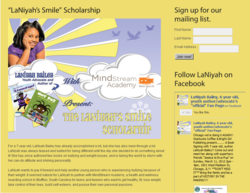 For parents and youth wishing to apply for LaNiyah’s Smile scholarship, applicants are encouraged to go to http://www.mindstreamacademy.com to sign up. LaNiyah’s Smile is a gift of financial assistance issued from LaNiyah Bailey to a young person age 12-17 to attend MindStream Academy. Scholarship recipients will be determined by their compelling story as well as youth who most exemplify LaNiyah’s message of tolerance, understanding, and hope. MindStream Academy (http://www.mindstreamacademy.com) is a full-service boarding school on a pristine 43-acre horse farm in South Carolina for teens and tweens who want to get healthy, fit, lose weight, take control of their lives, build self-esteem, and pursue a personal passion.